Ideal Tax Solution, LLC is raising the caution flag in an effort to alert taxpayers to protect themselves against a wide range of tax fraud schemes which proliferate during tax filing season. Ideal Tax Solution, LLC is passing along information it has received involving the government’s list of “Dirty Dozen” tax scams for 2013. Every year, the IRS publishes its listing of the twelve most common tax crimes which can occur at any time of the year, but especially so during peak tax filing season. Identity Theft – Tax fraud committed through the use of identity theft is top on the list. Identity theft occurs when someone uses personal information such as your name, social security number (SSN) or other identifying information without your permission, to commit fraud or other crimes. Combating identity theft and refund fraud is a top priority for the IRS, and they are taking special steps to assist victims. Ideal Tax Solution has trained professionals on staff who work closely with the IRS to resolve identity theft issues. Phishing – Phishing is a scam typically carried out through the use of unsolicited email or fake websites that pose as legitimate sites to lure in potential victims and prompt them to provide valuable personal and financial information. With this information, criminals can commit identity or financial theft. Ideal Tax Solution educates its clients on the best ways to avoid falling prey to Phishing. Return Preparer Fraud – Sixty percent of taxpayers will use professional tax services to prepare their tax returns this year. Most tax preparers provide honest service to their clients. However, some unscrupulous preparers prey on unsuspecting taxpayers resulting in identity theft or refund fraud. Ideal Tax Solution has prepared thousands of accurate tax returns for its clients. Hiding Income Offshore; “Free Money” from the IRS and scams involving Social Security; Impersonation of Charitable Organizations; False/Inflated Income and Expenses; False Form 1099 Refund Claims; Frivolous Arguments; Falsely Claiming Zero Wages; Disguised Corporate Ownership; and Misuse of trusts. For a complete and detailed rundown of the “Dirty Dozen” tax scam list, contact Ideal Tax Solution or visit the IRS website for more information. About Ideal Tax Solution – Located in Costa Mesa, California, the company provides a full range of tax preparation and resolution services as well as reassurance to taxpayers nationwide. 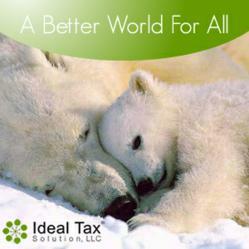 With more than 55 years of combined experience providing American taxpayers with federal and state income tax solutions, Ideal Tax Solution offers an experienced staff which includes Enrolled Agents, CPAs and Senior Tax Consultants who stand at the ready to help with any tax issues.